The St. Regis Maldives Vommuli Resort offers the famous St Regis brand contemporary style and the legendary luxurious services in one of the most magnificent destination in the world. 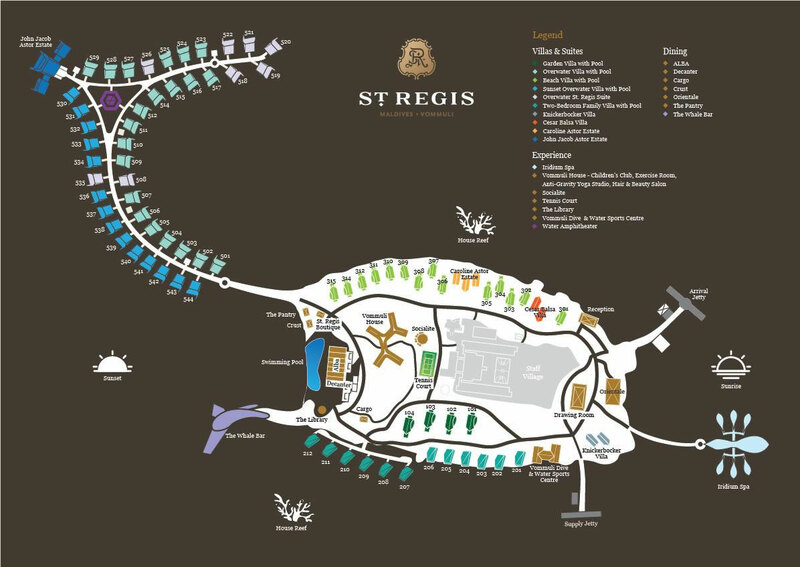 The new St Regis resort is 40 minutes by seaplane from Velana (Male) airport towards the equator. The hotel is located on the private Vommuli island, Dhaalu Atoll, and is surrounded by pristine white beaches with a beautiful lagoon and sparkling turquoise waters. The resort has 77 luxurious villas, each with original design, modern forms, natural materials and a fine color palette. There is a spa, an infinity pool (if the private pool on the terrace of your room is not enough for you), PADI diving center and a collection of fabulous restaurants. The St. Regis Maldives Vommuli is on our list of Top 10 most stunning hotels in the Maldives and the 10 best new luxury hotels of 2016-2017. The St. Regis Maldives Vommuli Resort brings luxury brand services in one of the most magnificent world destinations. St Regis is one of the most exclusive hotel brands in the world and is part of Starwood Hotels, which was recently acquired by the Marriott Hotel Group. Resort joined Starwood's dynamic local portfolio in the Maldives, including W Maldives and the Sheraton Maldives Full Moon Resort & Spa. St Regis Vommuli has an amazing location on a private island in Dhaal Atoll, one of the least exploited and most unspoilt atolls in the Maldives. Of the 56 islands in the Dhaal Atoll only seven are inhabited. Atoll is especially known for the excellent diving capabilities that it offers in almost every dive site. Atoll was recently opened for tourism, and St Regis Vommuli resort became the only real luxury hotel in this part of the Maldives. Getting to the resort is half the fun. By Trans Maldivian Airways seaplane is a short, 40-minute flight from Male airport. Flight by seaplane in the Maldives and admiring the pictures of the archipelago from a bird's eye view is one of the most impressive events of your trip that this paradise can offer. Loving the blue ocean, surrounded by tiny coconut islands, with transparent turquoise lagoons and sugar-white beaches, is breathtaking. If you do not like flying, a less relaxed transfer (if the weather is fine) on a speedboat will take you to the hotel within three hours. Upon arrival at Velana (Male) international airport guests can rent one of the resort limousines (if you are lucky you will get a single Bentley in the Maldives) and head to the magnificent St Regis lounge at Ibrahim Nasir Airport near the seaplane terminal where you will be waiting for an inviting in hydroplane. The new lounge - the best in the airport - has the same overall design as the resort itself, with soothing pastel tones. There is a small reception desk, several comfortable seating places (holds about 20 people) and a toilet with a shower (where you can refresh yourself after a long flight). On one wall there are windows from floor to ceiling, with a view of the seaplanes' dock. The arrival ritual to the resort makes a first impression. Approximately 10 staff members including top management line up when you leave the seaplane, they take turns to introduce themselves and shake your hand, accompanying them further into the open meeting pavilion, from which a picturesque view of the island and its clear lagoon opens. A welcome cocktail and a cold towel are offered, after which you and your butler are transported on a golf cart to your villa. Sensational architecture and interiors of the resort are truly stunning and evoke a sense of being in an island tropical village. The design was created by Singaporean architects from WOW Architects, and draws inspiration from nature itself, including local ecology. Such aesthetics include a branded bar called the whale shark, manta ray shaped overwater villas, an overwater spa in the form of a lobster, and a spiral shell shaped library. 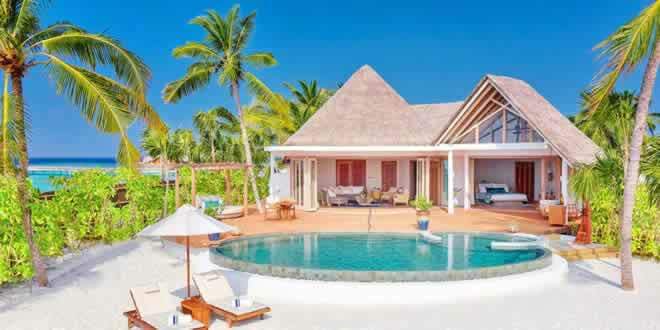 In addition to organic marine forms, some structures are based on local cultural symbols; For example, beach villas along the southern coastline are akin to Maldivian dhoni boats. We recommend to stay in the stunning 182m² Sunset Overwater Villa with Pool with a large outdoor terrace and with its own small pool and direct access to the lagoon and to the house reef. Plush couches, sun beds and surface hammocks are ideal for relaxation under the Maldivian sun. The views of the ocean are harmoniously combined with the impeccably chosen bedroom furniture and wooden interior, complemented by an elegant glass chandelier and an elegant palette of cream, cobalt, sea foam and brown. In the center of the room is a luxurious king-size bed next to a fluffy sofa, padded stool, armchair and polished side tables that form an attractive seating area. Modern technology includes a Bang & Olufsen 55" LCD TV and iPad controls. The room also has a dressing room and an elegant desk. The bathroom is equipped with a lovely cream-marble bathroom, double washbasins (polished lamps and a LCD TV in the mirror), a rain shower, separate toilet and separate deep wash bath with Remiede toiletries (our favorite toiletries!). The signature St. Regis butler service tends to each guest request promptly and discreetly. Garden Villas (150m²) vare situated within the tropical gardens with their own private garden and vast 24m² plunge pool, offering complete seclusion and the chance to relax to the soundtrack of the jungle wildlife from the wooden gazebo and bench swing. Once through the floor-to-ceiling glass doors, the interior offers a sense of space with a lofty wood ceiling and bathroom skylight. A private wooden deck houses an outdoor dual-head shower. Best of all are the 14 beach villas inspired by fishermen’s huts – although there’s nothing humble about their cathedral-like scale, sophisticated styling and plunge pool hidden behind lush foliage mere steps from the ocean. 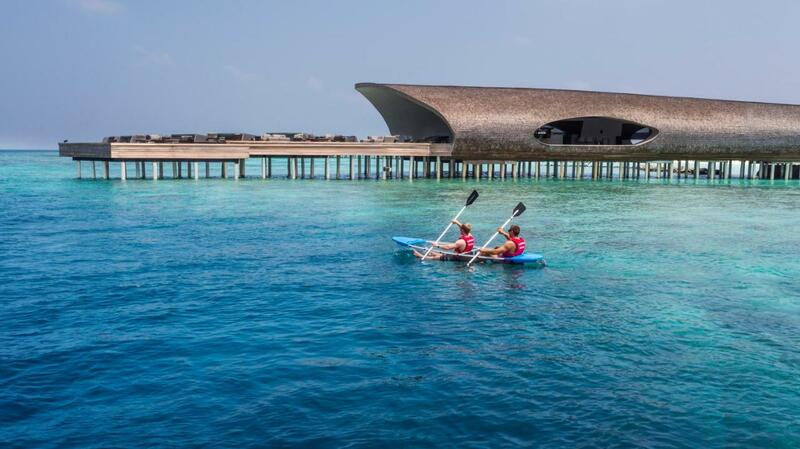 Also recommended are the 12 beachside family villas designed to resemble traditional dhoni boats. Caroline Astor Estate is beachfront, two-storey estate named after the celebrated mother of the St. Regis founder offers a veritable island home with 620m² of floor space. The villa houses two twin bedrooms on the ground floor and a king-size master bedroom with furnished balcony on the first floor, each with its own marble bathroom, the ground floor bathrooms also offering an outdoor deck with dual-head shower. The living space is further enhanced by a show kitchen and dining area for 6, and the expansive terrace features a 67m² private swimming pool framed by sun loungers and a plush daybed. The signature St. Regis butler service tends to each guest request promptly and discreetly. The most coolest accommodation in the resort - John Jacob Astor Estate - the largest water villa in the Maldives. 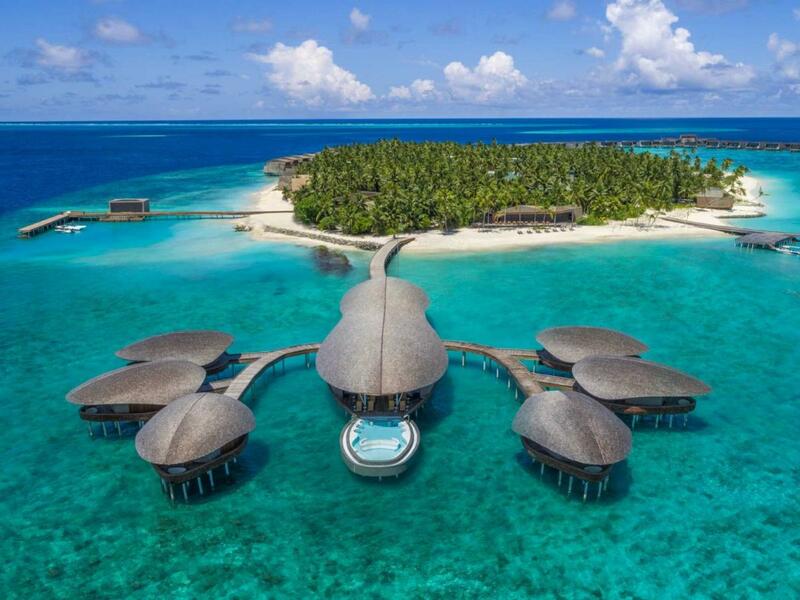 The ultimate overwater villa named after the founder of the very first St. Regis hotel in New York City, this venerable two-storey estate offers 1540m² of space. The apartments cover three different areas: a two-storey main villa includes a private pool, a spacious deck with a swimming pool, a living room, a master bedroom, a show kitchen, spa, mini cinema and a fitness center; and two other villas in the lagoon attached to the first, each of which has its own swimming pool, a sun deck, a bedroom and a living room. This villa is something to behold, and a fantastic option for larger families who want the very best villa that money can buy. If the size of the private pool does not satisfy you, you will be pleased to learn that St Regis Vommuli has a beautiful white sandy beach with a large outdoor swimming pool overlooking the lagoon and the dreamy Indian Ocean horizon. The beach club offers comfortable sun loungers and delicious cocktails by the pool for all guests, and younger VIP guests can enjoy a swim with a splash of delight in the neighboring pool. The beach club is located on the west side of the island and boasts of indelible sunset views. Behind the pool are two small, but remarkable structures. In one of them is a library that has the form of sea shel spiral and contains a curatorial collection of books, as well as two workstations with printers - an ideal place for work or study. In the other building there is a boutique store, in which collections of elegant ornaments, fashionable clothes and accessories are presented, which can be selected on the first and second floors. You can also climb the store's spiral staircase to the third floor, where the observatory tower offers dramatic views of the Indian Ocean through the swaying palm trees that dot the coast of the island. Behind the swimming pool located in the tropical interiors of the island, you will find Vommuli House, the largest recreational center in the Maldives. In a massive building there is a yoga studio (do not miss levitation lessons), a fully equipped fitness center, a hairdresser and an impressive kids' club. The latter takes care of children between the ages of 4 and 12 who can also attend yoga classes complete with meditation, cooking courses in the children's kitchen or participate in creative arts and crafts, including origami and painting. A nearby club, located next to Vommuli House, welcomes teens from the age of 16 and older to take part in various recreational activities and sports, including table tennis, table football, pool and air hockey, as well as video and board games. Located on the west side of the island, the Diving & Water Sports Center (Vommuli Dive & Watersports Center) provides any active activity, whether it is deep sea fishing, kayaking, jet skiing, parasailing, water skiing, kite surfing, wakeboarding, sailing, catamaran and windsurfing. A fully equipped 5 * dive center PADI provides standard diving courses, certification and expert equipment ScubaPro for security. Most guests are sent here on their first day at the resort to get free snorkelling equipment, and explore the vibrant marine life on the resort's house reef. Free kayaks and SUP are also offered. Emerging from the sparkling waves of the Indian Ocean, the huge Iridium Spa is made in the form of a giant lobster and has a sumptuous atmosphere made up of white oak interiors to create an atmosphere of elegant tranquility. The play of sea life can be observed through glass floors. There are 6 treatment rooms in the resort, including two Ayurvedic suites with separate thermae all of which have private terraces with baths for washing to provide relaxation, supplemented by a fresh ocean breeze. Eyechatcher is the so-called Blue Hole, the largest pool for hydrotherapy in the Maldives, where heated sea water and many hydromassage jets relieve tension, offering therapeutic benefits for both the mind and body. During the stay, guests can use St Regis butler services 24 hours a day. St. Regis Butler Service has been a brand name for more than a century. From a forgotten object while traveling to a perfectly tailored suit ready for an important meeting, to your favorite book at hand for evening reading or a thoughtful gift at the last minute for a loved one, all questions are solved. The food at the resort has an exceptional quality of the Michelin star and represents some of the best dishes that you have ever tasted at world's resorts. The hotel offers at least six different dining venues, ensuring that your stomach does not get bored, even if you stay here for a week or more. The 3 main restaurants are beach asian Orientale restaurant, the popular Cargo restaurant serving Lebanese cuisine in the heart of the lush vegetation of the resort, and the modern Italian Alba restaurant with a grand staircase located behind the main swimming pool. The latter also has an underground wine cellar called Decanter, where you can dine surrounded by white oak wine cabinets that showcase the prestigious selection of exclusive wines since 1755. An impressive breakfast deserves a special mention, as it is the most generous portion, compared to other luxury hotels in the Maldives. The buffet is located in several adjacent rooms (including an open kitchen) at Alba restaurant and represents literally everything you can wish for, from cold meat, dozens of bread options, high-quality cheeses and an impressive selection of fresh fruits. A simple walk through the buffet is breathtaking, as St Regis Maldives Vommuli raises the concept of breakfast at the hotel to a new, unprecedented level. In addition, there is an extensive menu with dozens of a la carte items to choose from. Breakfast at the hotel is even more impressive, given the remote location of the island. Next to the pool, Whale Bar is an architectural wonder that comes out of the azure waters of a house reef inviting guests to take a table on the terrace above the water and enjoy a selection of local seafood, freshly prepared tapas, wines and spirits. This is the best place in the resort to admire the magnificent sunsets in the Maldives and listen to good music. The distinctive shape of the Whale Bar resembles a majestic whale shark. The ceiling is decorated with a branded ceiling fresco. Regis, inspired by marine life pyrographic work, created by the famous artist Maya Berman. The painting depicts a father and son opening a paradise of corals, fish and plankton - the celebration of the bright marine life of the Maldives. St Regis Vommuli is rich with experiences both above and below the water. From world class diving and snorkelling through to sailing, kitesurfing and waterskiing, you will struggle to be bored here. Off the water, the property boasts excellent tennis courts, the Iridium Spa, an aerial yoga studio with daily sessions and a recreation room. The staff on the island are always up to be challenged to a game of football if you are keen! Located in the Vommuli House area of the resort, the kids club is open to children from 4-12 years, and offers a range of activities for all ages. The outdoor playground is a popular addition, along with the dedicated, and very high specification children's kitchen. The island's natural beauty is a visual feast, but tropical vegetation still needs some maturations in certain areas, especially along the beach and around the beach club. We are confident that the island will look even more stunning and lush after passing several monsoon seasons. The beach is wide, clean and beautiful. But this is not the best beach (yet) in the Maldives, as white sand does not feel very soft underfoot, and some beach areas are artificial. Honestly, this is a problem with most of the newly developed resorts in the Maldives. With the completion of construction works, nature now has time to rebuild itself, so the quality of the beach will improve over time and will likely compete with the best beaches in the Maldives. The island is small, and literally every corner of the beach was used to build restaurants, villas and other facilities. Vommuli lacks the sensation of a deserted paradise island that offers some of the other elite resorts of the Maldives. But again, I am sure that once the vegetation is fully mature, most of the beach villas and beach facilities will be hidden in the lush foliage, which will contribute to the picturesque island paradise beach, with which the Maldives are known all over the world. At World Spa Awards 2018, the resort received four of the most respected awards including the ‘Maldives’ Best Resort Spa 2018’, ‘Indian Ocean’s Best Resort Spa 2018’, the ‘World’s Best Resort Spa 2018’, and the ‘World’s Best Spa Signature Treatment 2018 for its Caviar Journey’.